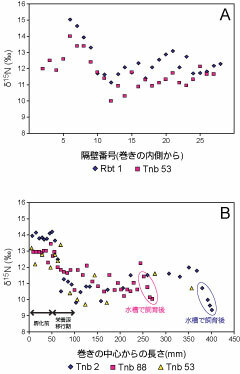 Chikaraishi Y, Kashiyama Y, Ogawa NO, Kitazato H, Ohkouchi N (2007) Metabolic control of nitrogen isotope composition of amino acids in macroalgae and gastropods: implications for aquatic food web studies. Marine Ecology Progress Series 342: 85-90. DeNiro MJ, Epstein S (1981) Influence of diet on the distribution of nitrogen isotopes in animals. Geochimica et Cosmochimica Acta 45: 341-345. 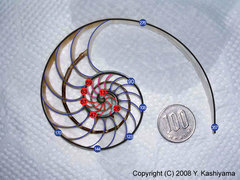 Landman NH, Cochran JK, Rye DM, Tanabe K, Arnold JM (1994) Early life history of Nautilus: evidence from isotopic analyses of aquarium-reared specimens. Paleobiology 20: 40-51. Minagawa M, Wada E (1984) Stepwise enrichment of 15N along food chains: further evidence and the relation between delta15 N and animal age. Geochimica et Cosmochimica Acta 48: 1135-1140. Moriya K, Nishi H, Kawahata H, Tanabe K, Takayanagi Y (2003) Demersal habitat of late cretaceous ammonoids: evidence from oxygen isotopes for the campanian (Late Cretaceous) northwestern pacific thermal structure. Geology 31: 167-170.